Despite rising doubts as to Carole Migden’s claim that her “wild ride” occurred during state business, Beyond Chron has learned that the Schwarzenegger-controlled Department of General Services issued a $335,000 check to Migden’s victim last week. Sources told Beyond Chron that while members of the Attorney General’s office were seeking further investigation of Migden’s claims, others in Jerry Brown’s shop quickly moved to ensure a check was cut to the victim. This leaves angry taxpayers with two remedies. A taxpayer could sue the Department of General Services for misusing state funds, or the Attorney General’s office could submit “new and compelling evidence” that Migden was not on state business, leading the Department of General Services to sue Migden for reimbursement. New questions are still emerging about Migden’s incident, none bigger than this: did Carole Migden have a history of driving great distances to meet with non-elected officials to discuss policy issues, as she claims she was doing when her accident occurred? And if not, why did the Attorney General’s office do virtually no investigation and instead take a politicians’ word at face value? Despite public outrage over the state paying former State Senator Carole Migden’s reckless driving claim, the Attorney General’s office moved quickly to issue a check to the victim. But this should not end the investigation. The focus must now shift to the Attorney General’s bizarre handling of this case, and to Governor Schwarzenegger’s role in assisting Migden. The Governor now only had one of the departments under his control move with record speed to pay Migden’s claim, but inconceivably appointed Migden to a $132,000 state job that provides her with a state car. Fixing Migden’s case then moved on to the Attorney General’s office, which inexplicably failed to follow up about media reports that Migden was driving on personal business to visit Joe Nation for a political endorsement when the accident occurred. The Attorney General’s office never spoke with Nation, and never questioned the likelihood that Carole Migden would drive 45 minutes to meet with a non-elected official to discuss problems at San Quentin (the story given last week by Migden’s attorney). Joe Nation was taken totally by surprise when he heard that Migden was now claiming that she was meeting him to discuss San Quentin, rather than to secure his endorsement in her race against Mark Leno. Shouldn’t the AG’s office have asked Migden about how often she had driven such distances for policy talks with non-elected officials, and examined whether her story had any reasonable basis at all? What if, as many suspect, Migden never engaged in such a practice. Wouldn’t that be important evidence in assessing her story? Shouldn’t the AG’s office have considered this before allowing the public to pay her $335,000 bill? Migden’s version of the purpose of her meeting with Joe Nation strikes many as inconceivable. And yet Jerry Brown’s Justice Department accepted it at face value. With stories in the Sacramento Bee, San Jose Mercury News, San Francisco Chronicle, and San Diego Union-Tribune all joining Beyond Chron in raising strong doubts about the Migden settlement, the question is whether these stories can generate a single taxpayer willing to file suit against the Department of General Services for misuse of public funds. Since this involves filing fees and other costs of suit, and the DGS can perhaps get away with arguing it simply relied on the AG’s Office, such a taxpayer suit could be difficult. A better scenario is for Jerry Brown’s office to send “new and compelling evidence” to the DGS showing that the AG’s office dropped the ball on the original investigation. But the only way this is likely to happen is if the Newsom for Governor campaign makes the botched investigation a political problem for Brown; they would be foolish not to try to do so. The surest remedy is to for the Legislature to reject Migden’s appointment to the California Integrated Waste Management Board, where she currently draws a $132,000 annual salary. This would not return the public funds spent on her settlement, but it would get her out of state office and prevent her from causing further claims from driving a state car. Migden was appointed by Schwarzenegger, and must be approved by the Legislature within 365 days. Republicans will unanimously oppose her confirmation, hoping they can use Migden’s settlement as the centerpiece in the 2010 elections. The Legislature’s strong Democratic majority would be out of its mind to confirm Migden’s appointment, yet we know how politicians stick together. There may be the feeling that the claim controversy has blown over in a few months, and assuming Migden still has friends in the Legislature, they could quietly move to confirm her. Those angry over Migden’s special treatment might let their state representatives know that they oppose her confirmation. The Governor’s giving of another state car to Migden is unconscionable. If a Democratic Governor had taken such action, Bill O’Reilly and Sean Hannity would talk about it every night and our Republican-dominated newspaper editorial boards would be demanding that said Governor intervene to remove Migden from office. 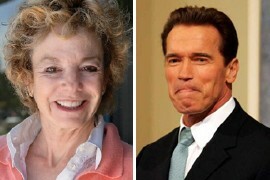 But the media has always had a double standard for Arnold Schwarzenegger, and his giving Migden a state car has not impacted the political radar screen even after the announcement that the state would pay her reckless driving bill. The state’s handling of Migden’s reckless driving claim is emblematic of the mess in Sacramento, and like the budget crisis, our Governor bears primary responsibility.